I've got nothing against nickel. I have no nickel sensitivities. I am not afraid of getting my nickel coils too hot and inhaling nastiness. But why are we still using it? Why is it still the number one TC wire? The DNA 40 from Evolv introduced us to temperature control using Ni200 in mid-2014. Soon after, Titanium was added to the temperature control devices a little later. Then came the idea of adjustable Temperature Coefficient of Resistance (TCR) and any wire with a stable TCR curve could be used. Today, the SMOK XCube II and Mini, the Koopor Mini and Plus, the DNA 200, and a slew of Nickel Purity enabled mods from China all have adjustable TCR and can use Nickel, Titanium, Stainless Steel, NiFe, and several other wires successfully in temperature control. 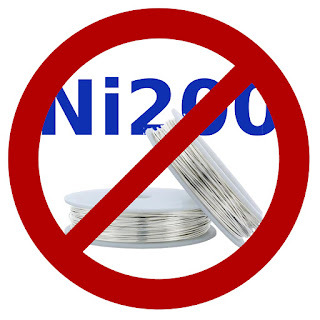 Thinking this out a bit further, some of the problems being reported by users is a lack of knowledge about Ni200 and Ti coils and accidentally putting a TC coil on a non-TC mod. The latest bit of joy comes from Kimree, makers of the Kimsun STL Wolf Mod which ships with Ni200 coils that are not marked as Ni200 coils leading people to vape them in wattage mode on a device that may, or may not, have temperature control. With this in mind, why don't all temperature control mods com with the TCR for Stainless Steel standard and the other wires as add ons? Stainless Steel can be used on a mech mod, a variable voltage mod, a variable wattage mod, and on a temperature control mod (although, I would keep it in variable voltage mode, bypass/mech mode, or temperature control mode - it can act a little funny in wattage mode). It can be dry burned. It can be cleaned and re-wicked without seriously deforming the coils. It is readily available in several different grades. Temperature control devices are not going anywhere, but nickel is dead. Let's shed a tear and move on already.